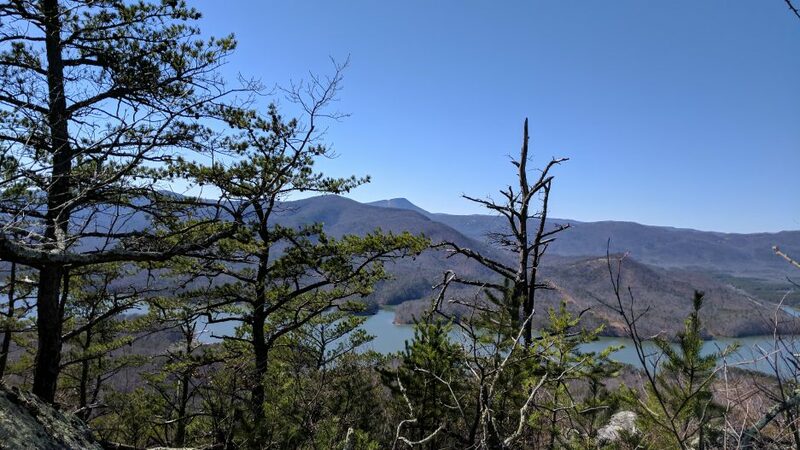 One of the many loved hikes in our area is Angel’s Rest – located on the Appalachian Trail near Pearisburg, VA. I have read about it, heard about it, and dreaded it for years. Mostly I have heard how steep it is (1500 ft. elevation gain, from the road, more if you start from the parking lot below). But considering some of the hikes I have managed lately, I was ready to give it a try. and enjoy the serenity of having the woods to yourselves. I was surprised by the trail. Being on the AT, I expected it to be much rougher. The ascent was steep, for sure, but the trail was well traveled and not very rocky – at least in the beginning. Of course it did become a more difficult climb as we neared the top. Isn’t that always the way, you want to be there, you think you can’t drag your body up one more step, and then you turn a corner and see that the trail goes straight up – ugh! From the road where we parked, it was 1.77 miles to the top. And, a pretty nice reward awaits you when you arrive. Of course, most people know that there is an even better view if you are willing to walk another 1/2 mile. Which we did; and it turned out to be a very delightful part of the hike. At this point you are walking on top of Pearis Mountain and the trail is pretty easy going. The rocks provided a perfect place for a rest and a snack. Since we were already up there, we decided to make the most of it and followed the AT a little further just to see what was there. Unfortunately, after about a quarter mile, the vegetation seems to take over and in places you start to wonder if the thru hikers found an alternate route. We turned back, but later took another detour to a water source. Saw this glass angel that someone left – sorry about the quality of the photo, but felt like I needed to include it anyway. And then we prepared for the long hike downward. I’m so happy to have this hike under my belt. It was not nearly as difficult as I anticipated, but definitely one that will get your heart pumping. As usual, the descent took a toll on knees and hips, but after a good night’s sleep, I’m feeling fine. With the weather in the 80’s, the sun burning bright, I cannot imagine any place I would rather be than on a mountain with JG. Five hours, over 6 miles, and another perfect day. Oh my – I missed the decimal point in your mileage and read 177 miles 🙂 Still it looks like you maybe went that far given the magnificent panorama at the top! The AT sure is beautiful!! If I hiked 177 miles, I wouldn’t live to tell about it – ha! So happy to have found your site! My husband and I just completed 720 kms on the Camino Trail. We are now looking for our next big (and small) hiking challenge. Looks like your site has lots for me to explore. If you have any specific recommendations, I am especially interested in multi-day hikes that offer hostel to hostel or lodge to lodge hiking. The Appalachian Trail is more for hikers who camp – there are hostels but not many. Norway probably has the best hostel – to – hostel hiking. Southwest Virginia, where I live, has some spectacular day hikes, which is mostly what I do. I wouldn’t say “fully” but I’m definitely in good hiking shape, thanks. Isn’t that often the case with a task we have ahead of us? We dread and even fear it, but in the end, once we get going, it’s not nearly so bad as I thought it might be. I’ve said it before and I’ll say it again … I envy your proximity to the AT. It sounds like a hiker’s paradise. Yes, Joanne, you build it up in your mind, and I think the fact that I anticipated it being so difficult, made it seem easier. I love to get going on a hike in the early a.m. (although I’m not always successful). Cool temps, fewer people, and lower sun slant (for better pics). You sure were rewarded with beautiful views after a challenging climb. I used to be a morning person, but what used to be natural of waking at 5, now becomes a struggle getting up by 6:30 or 7 – that’s what retirement did for me, thanks retirement! Oh my, I can relate to this! Another wonderful day, another beautiful hike, and oh, what glorious weather. I enjoyed seeing the glass angel. I have a blurring photo of an owl that I plan to include in a future post. It helps tell the story and that is half the fun. I wish I’d gotten a clearer shot of the angel, it was such a delight to see. I know the feeling. I’m glad you spotted it, though. What a nice surprise. I enjoyed landscapes, which You presented thru Your beautiful photo. Thank You. Regards from Finland. So grateful for your words of encouragement for those of us that struggle with taking the first step what a testimony to the joys and hidden surprises that await us on the journey if only we are brave enough to go for it!! Sometimes the anticipation is worse than the actual deed. It is fun to find those little surprises.